Set in a stunning rural location, Dannah Farm offers guests unashamed luxury in superb accommodation. Whether you are looking for a romantic honeymoon hideaway, an anniversary extravaganza, or are simply a discerning business person looking for somewhere special to relax at the end of a long day, hopefully you will find it at Dannah Farm Country House. The only accommodation in Derbyshire to have been awarded 5 stars (guest accommodation) from the AA, and a Little Gem Award from the RAC, Dannah Farm Country House is an eclectic mix of items and styles from the past combined with contemporary ideas in furnishings and fabrics. The overall effect is stunning, particularly in the feature rooms with their wonderful bathrooms, huge beds, squashy sofas’ and attention to detail second to none. Every room is unique, so whatever your style, have a peek at our website and let us offer you an extra special room, perfect for those occasions when only something truly different will really hit the spot!! Situated on the southern fringes of The Peak District, Dannah Farm Country house offers guests individual and stylish accommodation full of that all important WOW factor! Discover rooms with double spa-baths, wet-rooms, four poster beds and spiral staircases leading from private sitting rooms to romantic beamed bedrooms above! Sample a luxurious bedroom with double spa-bath and private sauna, or pamper your partner with a stay in 'The Studio Hideaway' with superb Canadian Spa outdoor hot-tub (pictured right) set on its own private, secluded terrace, overlooked by nothing but the rolling farmland. Winners of many local and national awards, Dannah Farm combines classic country with innovation and luxury. We are, of course, licensed, and are able to offer our guests dinner, most evenings by prior arrangement. Alternatively, for those who wish to venture further afield, we are happy to share with our guests our own favourite places to eat out in the area. Part of The Chatsworth Estates at Shottle and still a working farm, we have 150 acres to explore, including our own medieval moat! 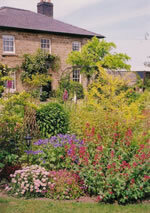 Full of character and charm our gardens and grounds are as beautiful and varied as our interiors. We have twice won the Amber Valley 'Best Kept' competition for most decorative hotel/guest house in the area. Relax a while in our large walled garden with cottage garden borders, admire the Koi pond, or visit our Kune Kune pigs, Charming Andrew and Sally Long Legs, in their home in the orchard. If you are feeling active, let our two English Setters, Cracker and Jack take you for a walk round the pretty country lanes and the bluebell wood in spring. If not, perhaps you would prefer to take afternoon tea in the orchard with its wonderful views over The Ecclesbourne Valley. We are located just 20 minutes from Derby City Centre, but secreted away down tranquil country lanes. Close to both Derby and Nottingham, Dannah Farms central location is ideal for touring the many and varied attractions of Derbyshire, from Chatsworth House and Haddon Hall to Crich Tramway museum and Denby Pottery. Situated amidst the stunning scenery of the Southern Peak District, high above The National Heritage Corridor, recently designated a World Heritage Site, Dannah Farm nestles just below Alport Heights with its magnificent views over the surrounding six counties. 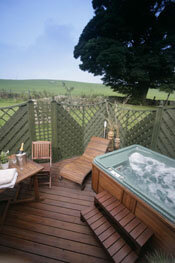 Dannah Farm Country House, the perfect hideout, whatever you seek to escape! The accommodation has to be one of a kind; the rooms are perfectly presented with all the modern features combined with styles from the past. The main points that struck us at Visit Derbyshire where, the attention to detail throughout each room, the effort that is taken to ensure all the guests are 100% happy, the magnificent views over The Peak District from every direction, how unique each room is, the list is endless all we can say now is that we would highly advise you to stay at Dannah Farm, we are positive once you have been you will not want to leave.